It should come as no surprise that we get political and not sincere reactions from politicians. If a reporter were to ask President Obama what he thinks of the Supreme Court’s recent ruling on the constitutionality of the Affordable Care Act, a bill he claims as a cornerstone of his presidency, he might say he’s glad because the decision means so many more Americans will be able to buy health insurance. We could believe the president is indeed glad for this reason, or we could believe he’s glad because he scored a political victory, or we could believe both. No matter how he feels, the president is putting out a calculated political statement: He wants to make sure you understand that more people will be able to buy health insurance because of this act. We tend to react politically when we know others are listening. I’m not sure what the point of acting politically is when others aren’t listening. Even though we know politicians are inherently political, it’s every politician’s goal to come off as sincere. When President Obama talks about the Supreme Court ruling, he smiles and looks charming in a way that’s supposed to make you like him, and like the idea he’s trying to sell (the Affordable Care Act is a good thing). It’s exactly what a salesman does. It doesn’t matter if the salesman really does or doesn’t care about the product he’s selling. She puts on her salesman face and tries to get people to believe her. Still, some folks are surprised when politicians do things for political reasons. For example, in the spring of 2012, President Obama made it possible for young illegal immigrants to be granted a two-year deferment from prosecution. This was seen by many as an obvious ploy by Obama to influence the Hispanic population for the 2012 election. The argument would go: Obama’s just doing something that will help him sell his brand to a certain sect of people, who will be more likely to vote for him in November. For many, this type of maneuver cuts against what they liked about Obama in the first place. 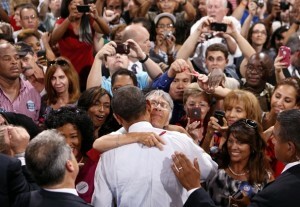 He inspired such hope during the presidential campaign of 2008 through what people took as his sincerity. Now they don’t want to see him doing overtly political things. Where is the guy I voted for, and who is this guy I’m supposed to vote for again? The problem with running as an incumbent is that many have seen you as a political rather than sincere figure for four years. We don’t get to see President Obama acting sincere very often. Even during last month’s Democratic National Convention, at a time when any candidate would want to move people, he opted for a more subdued acceptance speech. He’s more focused on working political angles, which makes him less trustworthy to some. So along comes a new candidate, someone who might strike a swing voter as sincere. This new guy needs to connect with people and quick. In the case of 2012 presidential challenger Mitt Romney, that means getting in front of folks and doing his best to charm the pants off of them. Unlike Obama in 2008, Romney rarely suffers from coming off as too sincere. He strikes many as contrived, seemingly incapable of speaking from the heart. That doesn’t mean he can’t win, it just means he can’t rely on his sincerity to help him win. He has to work more from political angles to influence voters. Obama, who’s had a far from perfect four years in office, has weaknesses in this election that can be exploited politically, and Romney spends much of his time on the campaign trail emphasizing the rising deficit, his successful business background, the problem of unemployment. Still, without connecting with voters on a sincere level, it’s hard to see him posing a real threat to Obama in this election. Current polls seem to bear this out. 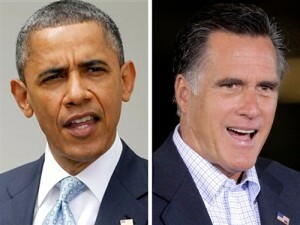 Romney has two clear advantages over Obama in 2012. One is that he’s the new guy. Despite his sincerity deficit, he hasn’t been in the Oval Office doing overtly political things for four years. No matter what he says or does over the next month, he can’t not be seen as a change come election day. His second advantage is financial. The Romney campaign, the Republican Party, and all of their related Super PACs will easily distance themselves from their Democratic counterparts in fundraising in 2012. There are many deep-pocketed groups willing to pay whatever it takes to remove Obama from office, and with the new freedom of Super PACs to raise and spend any amount as long as they don’t coordinate with their respective candidates, we’re entering a brave new world of campaigning. No one knows what effect this barrage of money will have on the outcome. Can cash replace sincerity for a political candidate? 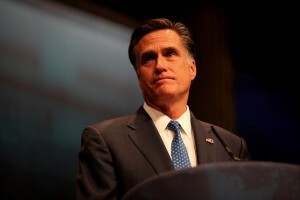 Does Romney have to worry about being sincere with the kind of money he’s got behind him? It’s fascinating to think America could, for the first time in my lifetime, elect a president very few seem to find sincere, but until November 7th, we have to wonder. Neither politics or sincerity is going away anytime soon. This is a good thing, as one keeps the other in check. If we ignore our sincere reactions to things, we leave ourselves open to being manipulated by politics. Likewise, we can’t ignore political arguments or we’d be completely under the sway of sincerity, which can lead to an entirely different kind of wrongheadedness. Both politics and sincerity represent truth. When they pull us in the same direction—like both my love for, and understanding of the path of, my favorite baseball team—that’s when we know we’re on the right track. The very core of your writing while appearing agreeable originally, did not sit properly with me personally after some time. Someplace throughout the sentences you actually were able to make me a believer unfortunately only for a very short while. I still have got a problem with your jumps in logic and you would do nicely to fill in all those breaks. When you can accomplish that, I will undoubtedly be impressed.